“Everything about Alpha was an inhumanly perfect imitation of humanity.” (Page 48). 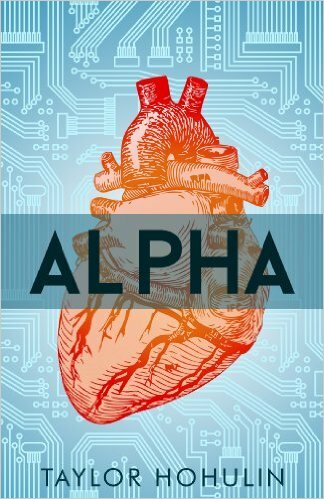 In Alpha by Taylor Hohulin, four characters come together to form a hilariously written story about how hard it is to build a military-ready robot and to get everyone to accept the idea of a robot military. The Doctor who builds the robots is all consumed with creating a robot that will be loyal to its military and fierce but not too threatening. The first robot he builds, his Alpha, is consumed with his heart’s desire and wants to love the doctor’s sister over anything else. Meat is the soldier with a chip on his shoulder, just forced into retirement from a military life and nothing to do but plot to destroy the very robot that threatens the careers of all future human soldiers. And finally there is the leader and CEO of the Planet Earth Military Forces who just wants to get back into action and be done with all the paperwork. With robots the likes of Douglas Adams’ characters in Hitchhiker’s Guide to the Galaxy, the book is full of little laugh moments. The way the story is written and the writing style itself will blow you away with its funny little insights into humanity and how people think and look at the world. Hohulin has built a hilarious world out of a mashup of what ifs in this book. What if a robot fell in love? What if a scientist wanted to create a military robot but kept failing? What if a former soldier didn’t want to retire? Meat is your classic all brawns and no brain character but he isn’t pathetically dimwitted. He can reason out logical conclusions and utilize resources and go about trying to attain his goal. He is not stupid, he is just single-minded. All he wants is to be a soldier and if he can’t do that for the Planet Earth Military Defense, well then he will wage war against any who opposed him rejoining the military and any who newly oppose him. Meat was a fun character to laugh at with his strictly logical thinking and surface level. I loved how the robots thought and how they were different in their personalities depending on how they were built and I was glad Hohulin decided to make Alpha the more prominent robot instead of spreading narrative thinly over all three robots. Alpha was the most interesting robot and the one with the most story to tell. This novel was published by Amazon Digital Services, Inc. on June 17th, 2013 and is available on Amazon here.